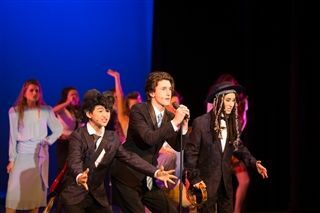 Audiences Fall in Love with "The Wedding Singer"
The upper school musical was a major hit over the weekend, with sold out performances January 27 and 28. A matinee show was added January 26 to give the Pacific Ridge community another opportunity to catch the hit play based on the movie of the same name. The cast and crew pulled out all the stops to entertain, and from the laughs, cheers and standing ovations that filled the theater, they met their goal. Many thanks go to Director Fredreka Irvine, Ms. Hansen, Ms. Clark and parent coordinators Christine Hamparyan and Tracey DeLange, for helping to making the show a smashing success.